These are some of the things that I feel are most important when it comes to investing, and your taxes. Short Term Capital Gains apply to any gain that is realized within one year. Short Term Capital Gains are taxed at your normal income tax bracket. It typically is a higher rate than what you will find in the Long Term Capital Gains rates. If you are in a higher tax bracket, sometimes it can be prudent to wait until after a year has passed to sell at a gain, so that you can qualify for the lower Long Term Capital Gains rate. If you are in the 10-15% Income Tax Bracket, than there is 0% capital gains tax on Long Term Capital Gains. If you are in the 25-35% bracket, the Long Term Capital Gain Tax rate that applies is 15%, and if you are in the 39.6% tax bracket, your Long Term Capital Gains rate will be 20%. If you have an income that is between $50,000-$150,000, you are likely in the 25-28% tax bracket. These numbers are current to reflect the new tax plan (2018). When people inherit or receive funds, they have to pay inheritance taxes. This is a simple chart to show the current Inheritance Tax Rates. If the value of someone's entire estate is above 5.6 million per person (a married couple can double this) they should try to chat with your attorney about doing additional planning to see what they need to do to protect their estate, such as gifting, and other tactics that they use in estate planning. Investments that have tax benefits, and accounts that have tax benefits- What's the difference? Annuities- They are issued by an insurance company- they have a special clause in the IRS code that allows them to provide Tax-Deferral. Tax Deferral means you can defer your taxes to a future date. You can buy and sell investments inside these accounts (such as Variable annuities) and avoid short term capital gains. Index Funds- Index Funds track the S&P 500, NASDAQ, DOW- These provide broad market exposure and low operating expenses.. These are tax efficient in a taxable account because there isn't any buying and selling in these funds. They correlate with the index that they track. They are tax-efficient because of their low turnover. ETF's- ETF's are a basket of securities that you can buy or sell like a stock. Investors can use these if they want to get more specific with what they invest in. You can purchase an ETF that invests in certain sectors- such as technology, energy, or healthcare. ETFs have two major tax advantages compared to mutual funds. Mutual funds usually incur more capital gains taxes than ETFs. Also, capital gains tax on an ETF is incurred only upon the sale of the ETF by the investor- mutual funds pass on capital gains taxes to investors through the life of the investment. In short, ETFs typically have lower capital gains, and they are payable only upon the sale of the ETF. MLP's- Master of Limited Partnerships offer the same tax benefits as limited partnerships, while providing the liquidity of publicly traded securities. REIT's- A real estate investment trust, or REIT, is a company that owns, operates or finances income-producing real estate. Thanks to the new tax bill that President Trump signed into law in 2017, REITs now boast this new and lucrative tax benefit: the pass-through deduction. This allows investors to deduct up to 20% of their dividends. Drilling/Energy Partnerships- There are certain tax benefits to drilling and energy partnerships, however, anything that has partnership in the name needs to be approached with caution. Over time, oil depletes from these wells, and thus it is a depreciating investment. 401k- 401ks offer a few tax benefits: Your contributions are generally made with pre-tax dollars, and you don't pay taxes until you withdraw funds. Your 401k contributions can be deducted from your annual income, thus lowering your taxes at the end of the year. IRA- Provides tax deferral, and you only pay your taxes when you take a withdrawal. Once you are over 70 and a half, you have to take a Required Minimum Distribution has to come out, and it is taxable. ROTH IRA- They are best suited for individuals who expect to be in a higher tax bracket when he or she starts taking withdrawals. Contributions grow tax-free, however your contributions will not provide you any tax benefit for the current year. You can convert a traditional IRA to a ROTH IRA, but when you convert from a IRA to a ROTH IRA, it is a taxable event. There are no Required Minimum Distributions for ROTH IRAs. SEP IRA- Mainly for self-employed people. They allow you to put more money into them each year than a traditional IRA. Certain Trust Accounts- Deferred Sales Trusts are typically used in ways to defer capital gains. Say you have a highly appreciated asset, such as real estate, and you want to try to avoid paying the capital gains tax. One of your options is 1031 exchange where you can switch it out for another property, or you can create a irrevocable trust account. In this case, you could retitle the property into that trust, and then sell the asset. The funds from that sale then go into a trust. Trusts are able to avoid being lumped into your estate, and thus having potential to lower estate taxes. Just like an IRA, you have to do a distribution on this kind of account every year, and you will have to pay taxes on that distribution. Too much tax-deferral- If you are a higher net worth individual, you want to be careful with tax-deferral. While the tax deferral may work well for you as the owner, but the beneficiary will inevitably have to pay taxes on that. You may be better off looking to Trusts and Estate Planning, things like that. UBTI- UBTI means Unrelated Business Taxable Income. When you have an investment that has some kind of income, such as you would see in a limited partnership where you would receive a K1 on, you may get a taxable account on something like this. It really only happens in the realm of limited partnerships. Interest Income and Social Security- Most people have to pay taxes on their Social Security, unless their AGI (adjusted gross income) is very low. When you start making investments, you typically do it when you are optimistic. As things go increasing in value, our confidence starts to increase, and people are generally more apt to take risk when they are feeling confident. Investors can find themselves overly confident, and almost invincible. Unfortunately, however, when the market turns on them it causes all the negative chain of emotions. Now, remember the old saying, the trick to investing is buy, low sell high. It's very counterintuitive because if prices are low, what do you think the news is like? The news is usually bad at low prices! That's why it's so hard to buy: nobody wanted to buy Ford at $2 when GM went bankrupt a week before. This was the best time to buy! It didn't make sense at the time because there was so many scary things going on in the news that it made it hard for many people to pull the trigger. The traditional way of asset allocation, or diversification, that I was taught when I came into the business was just like this: You split your account between stocks and bonds, equities and fixed income, because typically as the markets go down, fixed income stays even or goes up. It creates a balance. Some people use the Rule of 100- You would take your age, and subtract it from 100, let's say you're 70 and they would say, ok 30% of your money should be in equities ,and 70 in fixed income. That doesn't fit for each individual person. I have many clients that need the income their portfolio produces. Another percentage of my clients that doesn't need this income for themselves that want more growth, and are willing to take more risk. You really have to break it down for each individuals unique situation. The next thing that advisors that use the Traditional Asset Allocation model say is "let's diversify that." They start filling their portfolio with 10-20 different mutual funds, and say, "I'm diversified." You look diversified. But when the stock market goes down, all of these funds are going to go down too. Taxable Accounts- Trusts, Joint Accounts, Individual Accounts. Buy and hold works well for taxable accounts because you are able to avoid the taxes until you sell the investment. This works well for your long term portion of your portfolio. Tax-Deferred Accounts- IRAs, Variable Annuities, Roth IRAs, 401ks, SEP IRAs. Since you only need to pay taxes on these accounts when withdrawal the money, you can use these accounts to buy and sell investments more frequently. You can be more active and tactical in these accounts because of the tax-deferral. For a typical person that is tolerant of market risk, this model is designed to help diversify their portfolio in an efficient way. The center is the core strategy. The core strategy is your lowest cost of doing things. This is where you put your ETFs and individual stocks. These are things that you can buy and hold, based on brand value. Ideally, this would be happening in your taxable accounts, such as individual, or trust accounts. The one weakness with a core strategy, is that while the market is going up, you're going to love it. However, if the market goes down for a week or month you're going to hate it. But, you aren't trying to avoid a bad February or a bad week, because that is not realistic. You are trying to avoid a bad 2008. You only want to incur capital gains tax by selling things if you are avoiding downside. If you sell, you have to pay Uncle Sam, if you don't sell, the money goes down in the market. We then bring in tactical money managers that have a different perspective on markets. Their goal is to be in the market as it goes up, and be out of the market as it goes down. I have done my homework on about a hundred different money managers, and out of all that I have narrowed it down to about 4 that I would work with on a consistent basis. What this does is it smooths out the weakness of the core strategy. These managers adjust their market exposure according to what their algorithms tell them about risk. Their goal is to reduce correlation in the market when the markets are on the downside. This strategy works well in the Tax-Deferred accounts, because the short term buys and sells won't generate capital gains tax for that year, deferring it until you withdrawal from the account in the future. Then you can add in some alternatives. Most alternatives offer some kind of income, while hopefully hedging against rising interest rates, as well as stock market volatility. The most popular non-traded alternative out there would be the non-traded Real Estate Trust. Energy partnerships and private equities also fall under this category. They are typically much higher risk, and would only be a small portion of most people's portfolio. In this area you need to be careful, and for some people it is not appropriate. Standard Deduction: The Standard Deduction was raised from $6,350 for the 2017 tax year to $12,000 in 2018 for individuals. For couples, it is now $12,700 to $24,000. This is huge. The raise in the Standard Deduction helps all people, not just the rich. About 70% of people take a standard deduction, instead of the itemized deduction option, so many people will see a positive effect from this. Cap on SALT: SALT is an acronym for State and Local Tax Deductions- your interest deduction for your mortgage, and the local taxes that you pay. Before the tax reform, if the amount of interest you paid on your home was $15,000, and you had $5,000 in property taxes, you could itemize these and make a total deduction of $20,000 on your taxes. Now, they are capping these deductions to $10,000. Going into the tax season for future years, people will need to consider this. Mortgage Interest Cap: There is a certain amount of mortgage interest that you can deduct on your taxes. Before, if your mortgage was greater that $1 million, than you didn't get as good of a benefit. Now the cap is $750,000. We will see how that affects real estate, especially in a place like California, where it is hard to find anything under $750,000, especially along the coast. If you own multiple rentals, this is where you may want to have a chat with your accountant about what they call a pass through entity. Thresholds for Medical and Dental Expenses: In the past, if your medical expenses are greater than 7 1/2 percent of you AGI (adjusted gross income), than you get to itemize those medical expenses on your taxes. Now with the new tax law, in 2019 we will see that number move to 10% of your AGI. Charitable Giving: The area in which the charitable donations became more liberal is the percentage of an individual taxpayers’ adjusted gross income that can be deducted as cash charitable contributions. Through 2017 that percentage was 50%. Under the new law, that has been bumped to 60%. Pass Thru Entities: Corporate or Limited Liability Corp. are pass thru entities, which now get more benefits under this new tax law. This is something you may want to talk to your accountant about if you have multiple rental properties, or a small business that could benefit from this. For people that are in cash and planning on creating their core part of their portfolio, this discussion may be of interest to you. 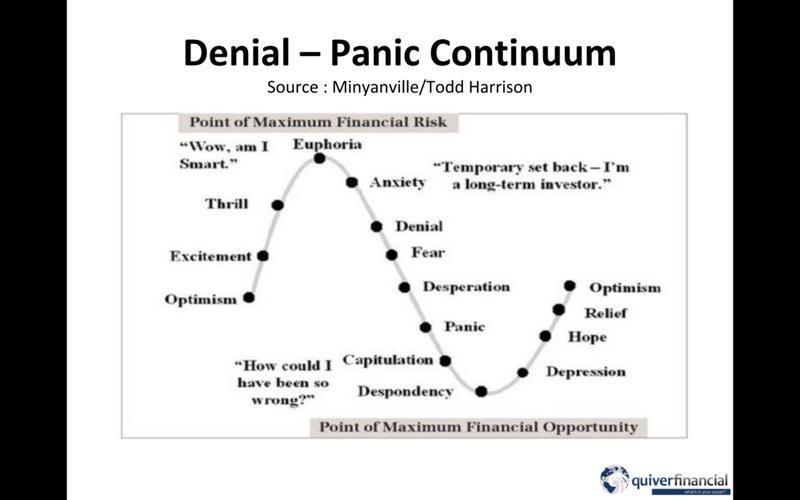 We haven't had a great buying opportunity, that is buying on a dip, in a really long time. The market has been consistently going up for the last two year. I believe that we are in the midst of a 4th wave, but we are at the very tail end of it. The market will likely continue to be very bouncy. The next chart will show a shorter time frame so you can see it better. This chart is of the last year. We had a little melt-up in the market, we had a horrible February. If this is a 4th wave, which is the move before the last move, we will see maximum frustration to the maximum number of participants in the market. You crater and hit a low like we did in February, and get a quick bounce off of it, which is what we saw. As you start building an allocation for someone, you make purchases over a period of time. When we retest that low point from February, we will go in and make our first purchase. This is where we bring in the tactical managers. The goal there is that they will help hedge the short term risks of investing directly in the market. When we dip down low again is where you go in to make our second purchase, and buy the valuable long term stocks and ETFs, the strong names that we know have value over time, and buy them at a discount. The third purchase is when the market is in recovery modes, and this is where you would make some higher risk purchases, because this is where you may be buying later in the process, and the higher risk investments will hopefully make up for that.